Axxess Pharma seeks long-term relationships, tested and proven breakthroughs with companies that have a shared vision. the lives of others. Through partnerships, we bring these products to our customers. It’s the power of innovation through partnerships that drives our company. 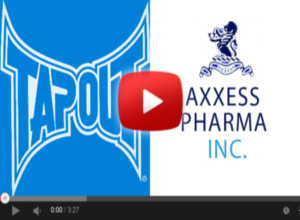 Axxess Pharma Inc. Signs Exclusive World-Wide License to Market and Sell TapouT Brand Vitamins & Minerals Pain Relief and Muscle Recovery Products.